Do you often feel weary heading to work? Many employees report feeling worn out on their job, no matter how much they love their work, their employer, or their workplace. Fortunately, you can be aware of and control most of the factors responsible for job dissatisfaction. 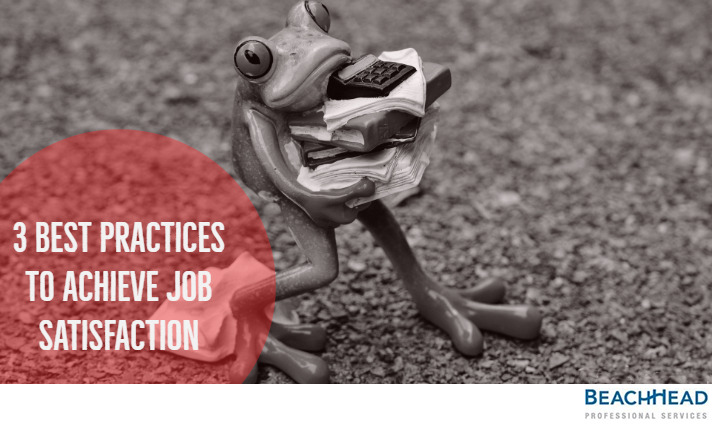 Follow our guide as we reveal the 3 best practices to achieve job satisfaction. Employer’s expectation of employees has increased as a result of frequent technological changes. According to one recent survey done by a global research firm around 70% of Americans report being disengaged at work and only 48% of employees have job satisfaction. The struggle to maintain a work-life balance while delivering exceptional work performance has a wider impact on your mental and physical health. Moreover, dissatisfied workers experience low morale and low productivity along with high levels of stress. Read on, and follow these tips to increase your happiness, decrease your stress levels and boost your performance at your workplace. Having strong interpersonal and work relationships is a vital parameter of success and satisfaction in your job and career. No matter your education, experience, or title, if you can’t play well with others, you will never accomplish your work tasks effectively. It is important to have a good relationship with your employer and co-workers. A cordial relationship brings a sense of connectedness without which it would be difficult to accomplish tasks and deliver results. Developing and nurturing relationships takes time and care. But in the long run, the relationships made can be one of the most satisfying elements gained from your job. You should focus on developing your skills of listening and providing positive feedback. Exchanging ideas and experiences can further your knowledge and skills, and also add meaning to your work. These qualities will stay with you throughout your life, and be potentially the most important outcomes of your work. Doing something that you love every day can help you overcome weariness and boredom at work. Discover small things about your job that excites you and makes you happy. Make sure these tasks are on your everyday to-do list. Doing what you love will not only keep you motivated but will also decrease your work fatigue. Tasks you enjoy will give you something to anticipate and a sense of accomplishment. Another way to make work more meaningful is to take on additional tasks that you find fulfilling and engaging. Even if this increases your workload, it can still be beneficial by making you feel happier about heading to work every day. Finally, if you can’t emphasize or add tasks, it might be possible to re-engineer existing ones by introducing an element that inspires you. A creative past time, usually unrelated to work, is a great way to relax, de-stress and take a break from the hectic schedule of your everyday job. If your hobby involves being outdoors, then you’ll also benefit from the fresh air, beautiful scenery and exercise. These three are also known worldwide as great stress busters. By regularly removing yourself from your monotonous job, you’ll feel much more energetic and ready to go when it is time to concentrate on your professional tasks and responsibilities. Having creative interests can also provide you with a topic of discussion within your workplace. Enjoying your time at work is important not only for you as an employee, but it is beneficial for your employer too. Being able to discuss extracurricular activities with your colleagues and manager makes the day more pleasant and builds relationships, which in return will increase your job satisfaction and improve your productivity. There you go! Practice these tips today and observe a considerable increase in your performance level. Please comment below and let us know if there are any other practices that you follow to increase your job satisfaction. We would be happy to add those to our list. Remember to connect with us on Facebook and follow us on Twitter and LinkedIn. Looking for a new opportunity? Connect with us at Beachhead, and we will help. You can also send us your resume at info@beach-head.com.